Colostrum provides antibodies to newborn calves, lambs and piglets. It is a high energy source for them. The best quality colostrum comes from the mother but artificial colostrum should always be available for those cases that cannot get enough. Different artificial colostrum brands contain different amounts of antibodies, we have been supplying only Immucol Lamb and Calf Colostrum for the last few years and have been very impressed with the feedback we have received. 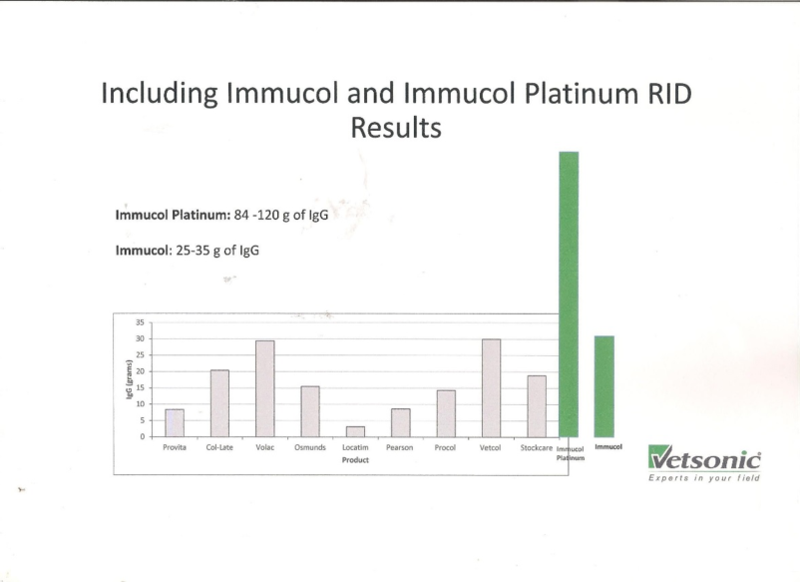 Lamb colostrum antibody (IgG) test results. 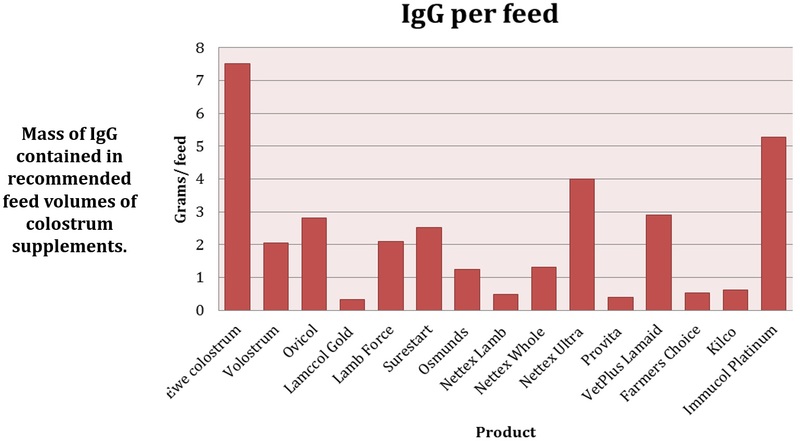 Calf colostrum antibody (IgG) test results. Feeding guidelines (natural or artificial colostrum). Calves – 10% of bodyweight given within 2-4 hours of birth. Lambs – 210-290ml / kg of bodyweight over the first 24 hours (eg a 5kg lamb should get 1,050-1,400ml in the first day – over 4 feeds, this would be 260-350ml per feed). Piglets – should suckle within 30 minutes of birth and consume at least 200ml in the first 24 hours. A calf needs to suckle continuously for 20 minutes to consume enough colostrum from the cow. It is estimated that almost a third of pre-weaning calf deaths occurring in the first 3 weeks of life can be attributed to failure to get enough colostrum. Calves with low antibodies are 1.6 times more likely to become ill, 2.7 times more likely to die before weaning and are twice as likely to get pneumonia as calves who get enough. A calf with higher antibody levels are, on average 3.5kg heavier at 205 days of age. Lambs fed adequate quality colostrum do not succumb to Watery Mouth – we are moving away from using antibiotics routinely at birth for watery mouth and using our Parkside Lamb Boost to ensure lambs get going quickly and take enough colostrum to make antibiotics not required. Colostrum intakes above 290ml per piglet lead to 6 week old weights being 2kg heavier. The shorter the interval between birth and first suckle, the lower the levels of pre-weaning deaths.